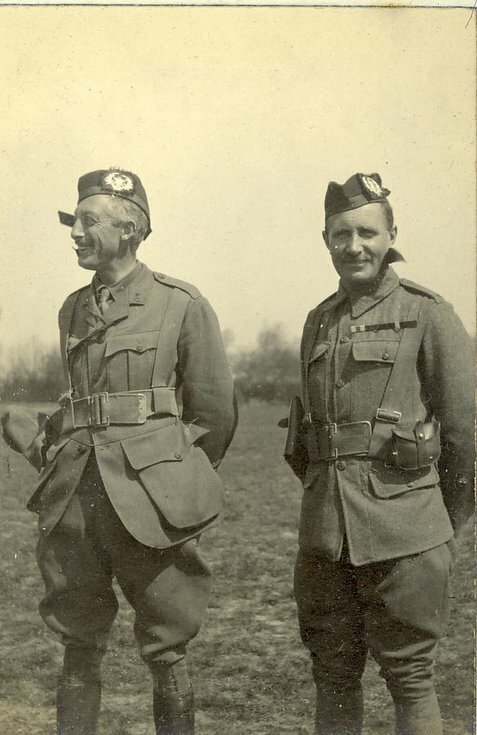 Major Richard Oakley on the left and Regimental Serjeant Major John Chalmers MC DCM on the right. This photograph was taken shortly after Major Oakley was sent to the 2nd Battalion – according to our album it dates to April 26 1915. After the Battle of Neuve Chapelle, the 2nd Battalion found itself without most of its officers; Major Oakley, who was 2i/c of the 1st Battalion, took over temporary command of the 2nd. John Chalmers is a fascinating character, and I have to confess, he is sort of a hero of mine. He was awarded the DCM while a Serjeant in the 2nd Battalion during the Boer War, and by the time the Battalion landed in France in November 1914 he was Regimental Serjeant Major. During the Battle of Neuve Chapelle, when almost all of the officers had been killed or wounded, Chalmers was the lynch pin that held the Battalion together. He was awarded the Military Cross for his efforts at Neuve Chapelle, and in this photograph he is proudly displaying the ribbon of his new decoration. Sadly, Chalmers was shot by a sniper near Le Transloy in the dying stages of the Battle of the Somme. I’ve visited his grave twice now; a cold, windswept corner of the battlefield just south of the Albert airfield…a rather dreary place, even on a bright spring morning. Chalmers had been offered a commission on several occasions, but would always politely refuse on the grounds that he could do more good for the Battalion as the Serjeant Major than as a Second Lieutenant. He really is a bit of a legend in the Regiment. My husband, Major Michael Oakley, Royal Artillery (retd) is really thrilled to have this article. Richard Oakley was his much-loved Uncle, and we have had a copy of the photograph of Richard with, as we now know R.S.M. Chalmers, for many years. If we can give you any more information about Richard Oakley, we would be glad to do so.